Commands for smooth left and right turns and forward motion of the wheelchair are processed every 125 milliseconds by analyzing brain waves using signal processing technology. Brain-wave analysis data are displayed on a screen in real time, giving neuro-feedback to the driver for efficient operation. This technology is expected to be useful in the field of rehabilitation, and for physical and psychological support of wheelchair drivers. 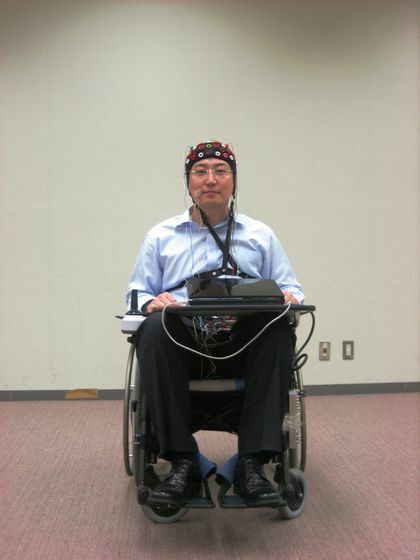 The BSI-TOYOTA Collaboration Center (BTCC; Hidenori Kimura, Director), has succeeded in developing a system which utilizes one of the fastest technologies in the world, controlling a wheelchair using brain waves in as little as 125 milliseconds (one millisecond, or ms, is equal to 1/1000 seconds). BTCC was established in 2007 by RIKEN, an independent administrative institution (Ryoji Noyori, President), as a collaborative project with Toyota Motor Corporation (Akio Toyoda, President), Toyota Central R&D Labs, Inc. (Takashi Saito, President), and Genesis Research Institute, Inc. (Kiyoshi Nakanishi, Representative Director of Research). Also collaborating in the research were Andrzej Cichocki, Unit Leader, and Kyuwan Choi, Research Scientist, of BTCC’s Noninvasive BMI Unit. Recently technological developments in the area of brain machine interface (BMI) have received much attention. Such systems allow elderly or handicapped people to interact with the world through signals from their brains, without having to give voice commands. BTCC’s new system fuses RIKEN’s blind signal separation1 and space-time-frequency filtering2 technology to allow brain-wave analysis in as little as 125 ms, as compared to several seconds required by conventional methods. Brain-wave analysis results are displayed on a panel so quickly that drivers do not sense any delay. The system has the capacity to adjust itself to the characteristics of each individual driver, and thereby is able to improve the efficiency with which it senses the driver’s commands. Thus the driver is able to get the system to learn his/her commands (forward/right/left) quickly and efficiently. The new system has succeeded in having drivers correctly give commands to their wheelchairs. An accuracy rate of 95% was achieved, one of the highest in the world. Plans are underway to utilize this technology in a wide range of applications centered on medicine and nursing care management. R&D under consideration includes increasing the number of commands given and developing more efficient dry electrodes. So far the research has centered on brain waves related to imaginary hand and foot control. However, through further measurement and analysis it is anticipated that this system may be applied to other types of brain waves generated by various mental states and emotions. 1 Blind signal separation (BSS) is a technology that separates the noise components and useful signal components from brain signals that can be used to control the wheelchair. It utilizes only on-line-recorded EEG signals. 2 Space-time-frequency filtering is a technology which extracts space and time patterns and frequency oscillation data from EEG electrodes to discriminate significant features and components which are able to reliably control the wheelchair.